In the winter when the rough grass has stopped growing and weeds have died down in our wood, the runs or motorways of the short tailed or field vole become more prominent. This little creature plays a very big part in the ecosystem that exists within our smallholding, because it is the main source of food for the Kestrels and Tawny Owls found at Fife Smallholder. Both these birds have nationally been in decline, and their presence here is a good example of the part that smallholdings can play in conserving wildlife in the countryside. What does a short tailed or field vole look like? Body length 10 – 12 cm. Grey-brown above, cream-grey below. The tail is less than 40% of body length, the tail is also much shorter than that of a bank vole. Ears are almost completely covered by fur, whereas those of bank vole are more prominent. The eyes are relatively smaller than those of a bank vole. 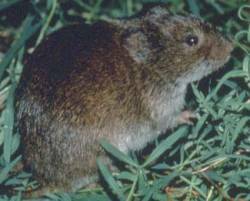 Between March and December, the short-tailed field vole may have as many as four to five litters containing 4-6 young. The young females are ready to mate at 6 weeks. Where do short tailed field voles live? They are found generally in moist grassy habitats, such as woodland, marsh, or river banks. Here we find them in the rough grass in our wood and wild areas. Although they dig burrows, they usually build nests above ground and build intricate runways through grasses. Sometimes, voles will use the burrows of moles to get around. Many vole families will share the runway systems. Voles feed on a variety of herbaceous plants and grasses. Voles feed on above and below ground plant parts such as foliage, seeds, stems, roots and bulbs. As food becomes scarce in autumn and early winter, voles may seek the tasty cambium of small tree roots, crowns and trunks. Trees chewed by short tailed field voles are stunted, spindly and have very little foliage. Leaves can even show signs of reddening and other water-stress symptoms. Damaged trees can look like they have been whittled near the trunk. The chew marks made by a vole can be recognized by: the pattern, location, and the size of the bite marks. Voles feed close to the ground, if not below ground. For trees, there are protective barriers available. These tree guards can be purchased or homemade. Guards are often made out of plastic. Make sure that the height of the guard is at least 12 inches and also plant the base of the guard deep enough that voles cannot burrow beneath them, 6-10 inches is enough. Check these guards regularly because you may have just made a cosy vole home! Kestrels and Tawny Owls eat the voles that are found in our wood and rough grassland on the smallholding. As an important food source for owls and some other predators, their population peaks and troughs in a four-year cycle. As they travel, field voles leave a trail of scent to warn off other voles. Hunting birds of prey, such as kestrels (identified by its characteristic hovering and perch hunting techniques) look out for the UV light that radiates from the trails. Tawny Owls prey primarily on short tail voles, field mice and shrews. They will hunt at day and at night but usually at first and last light. They will hunt in and around wooded areas and in fields. Tawny Owl numbers have dropped dramatically over the last 80 or so years. As the Tawny Owl (like most birds of Prey) are very high up on the food chain, any human changes that destruct and fragment the habitats and environments of animals at the bottom, invariably affects things at the top. Increase in stocking density of Sheep and greater silage production. Lots of food for Cows and Sheep but means that the grass is too short for voles to run around in. Kestrel populations have declined over the last 25 years, but has remained stable over the last few years. Population fluctuations generally tend to parallel that of its main prey species (the short-tailed vole) which has been affected by farming intensification and the lost of rough grassland. The Kestrel has also suffered from increased competition from other raptors that have recovered from the low population levels in the second half of the 20th century. The short tailed field vole is the preferred diet of Kestrels and breeding performance is closely tied in to the three-year cycles of this small mammal. In peak vole years Kestrel territory occupation is high, clutch sizes large and brood survival high. When the vole numbers bottom out after the peak the Kestrel occupation and productivity also falls. Snow can be good for voles as it protects their runs from the Owls and Kestrels, and voles can benefit from a fall of snow because it provides an insulating blanket over their territory. Voles can eat roots below ground, and can therefore continue to find food. Predators such as Tawny Owls and Kestrels find it much harder to catch voles after a snow fall and this weather can put great stress on these birds.